Although you’re exhausted by bedtime, your child seems to be bouncing off the walls when he is supposed to be getting ready for sleep. His excess energy means you get to deal with extra delays and protests. How is he supposed to get enough sleep when he’s so hyper? You may not be able to force him to fall or stay asleep, but you can increase the chances that he will be groggier when it’s time for him to unwind. Watch what your child consumes later in the day. Consider eating dinner earlier in the evening to allow your child to fully digest and get over the energy spike that comes from her meal. Also cut back on sugar intake a few hours prior to bed or else your child may be physically incapable of relaxing. Reduce caffeine from your child's diet as much as possible and eliminate it completely at least six hours before bedtime, advises the American Academy of Pediatrics HealthyChildren.org website. Allow only soothing nighttime activities such as reading a book, practicing on a musical instrument and playing a quiet game. Spending too much time in front of an illuminated screen (i.e. 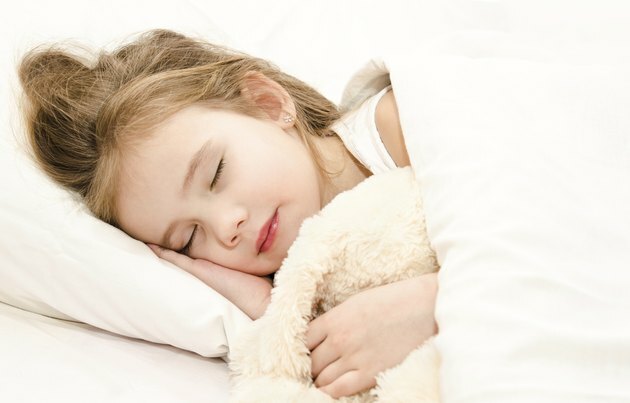 while playing video games or watching television) prior to bed may seriously hinder your child’s ability to sleep. Children who watch television in the evening before bedtime often get less sleep because they have difficulty falling asleep, states the American Academy of Pediatrics. Discuss self-soothing techniques with your child. Let him know that you understand what it’s like to have trouble sleeping sometimes, but that you can’t always be there to help her fall asleep. Perhaps you can guide her one night in saying prayers, counting sheep, taking deep breaths, thinking of a relaxing place, relaxing individual body parts and “sinking in” to the bed. The following nights, let her practice on her own. Remain firm in enforcing bedtime rules. For example—especially for children who can tell time—bedtime is bedtime. Also, you may decide that you will let your child call for you once each night, but after that “coupon” has expired, calmly guide him back to bed with no direct eye contact or conversation. If you don't follow through, your child's energy levels will rise as he tries to convince you to give him an extra 10 minutes or an extra hug and kiss. Create your plan of action, but don’t wait until bedtime comes around to develop or halfway enforce the new plan. Having clarity of an alert mind and agreeing on a set schedule will help you follow through. Your plan should incorporate ideas for your new evening routine, your bedtime routine, and any new rules and potential consequences you plan to discuss with your child.